Looking for a fun way to celebrate someone's special day? 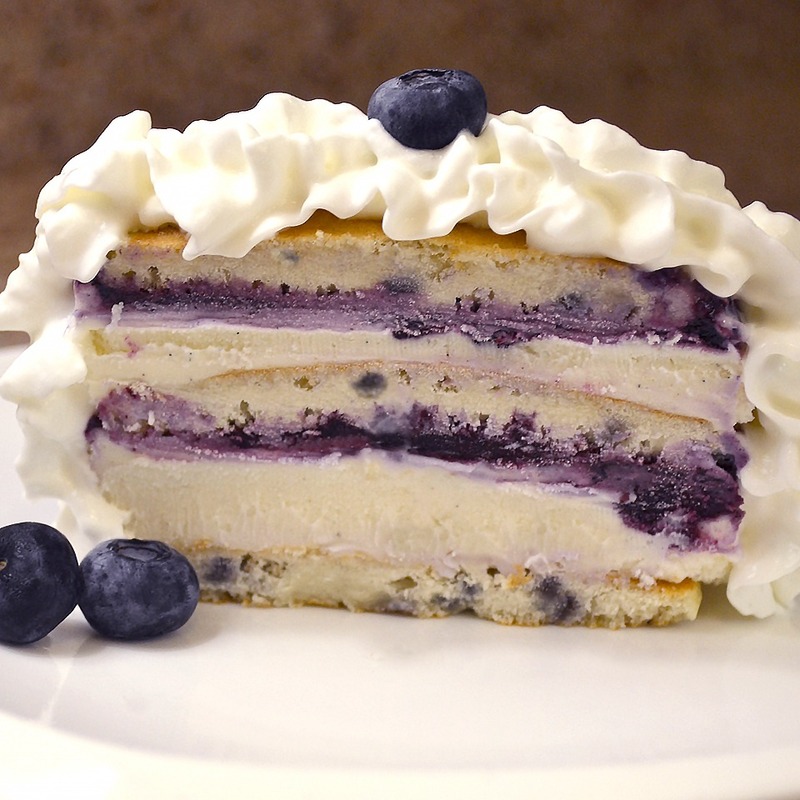 This Blueberry Ice Cream Cake made with our Blueberry Pancakes is the perfect alternative to a traditional cake (and much easier to make!) Layered with sweet, creamy ice cream and fresh blueberry compote, it's the perfect dessert to celebrate any occasion! Get ready for a cake like no other! First heat up 12 Blueberry Pancakes (3 at a time is recommended) in the microwave according to the package instructions. Set aside. As pancakes are cooling, prepare the blueberry compote – Using a medium saucepan, mix blueberries with the sugar. Mash the blueberries with a potato masher until all the juices are released and the sugar is completely dissolved. Separately, stir lemon juice and cornstarch together in a small mixing bowl and add to the saucepan. Boil for 1 minute, while stirring, until the mixture thickens. Pour the blueberry compote into a bowl and set aside to chill for about an hour. Finally, it’s time to assemble your cake! Line a stainless steel or glass loaf pan with 2 sheets of plastic wrap. Line the interior of the pan with 4 pancakes, letting them overlap a bit. Then, take 1 spoonful of ice cream (or yogurt) and spread over the pancakes, followed by half of blueberry compote. Swirl the compote gently through the ice cream with a spoon. Layer 4 more pancakes on top of the first layer, pressing gently to form an even layer. Repeat this process to make another layer, and top it off with the last 4 Blueberry Pancakes to complete the cake. Wrap the cake in plastic wrap and stick it in the freezer for about 3 hours. When you’re ready to dig in, take it out, invert it, and unwrap it. Cover the cake with whipped cream and garnish with fresh blueberries. Time to celebrate!